In another one of our many stops today for our CES 2016 coverage, we visited our friends at EVGA. They had some pretty cool things to show off. 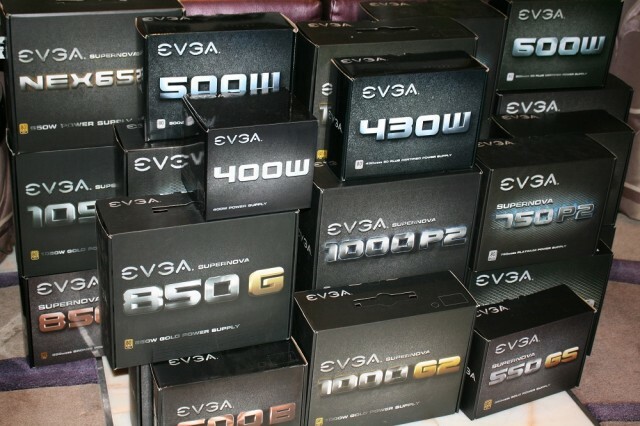 EVGA has steadily expanded their product lineup over the last couple of years moving into peripherals, power supplies, and even their own memory. That trend continues this year with them expanding into the full tower case market, gaming laptops, AIO watercooling, and even a discrete sound card! Read on for more details of that and other twists on existing products! 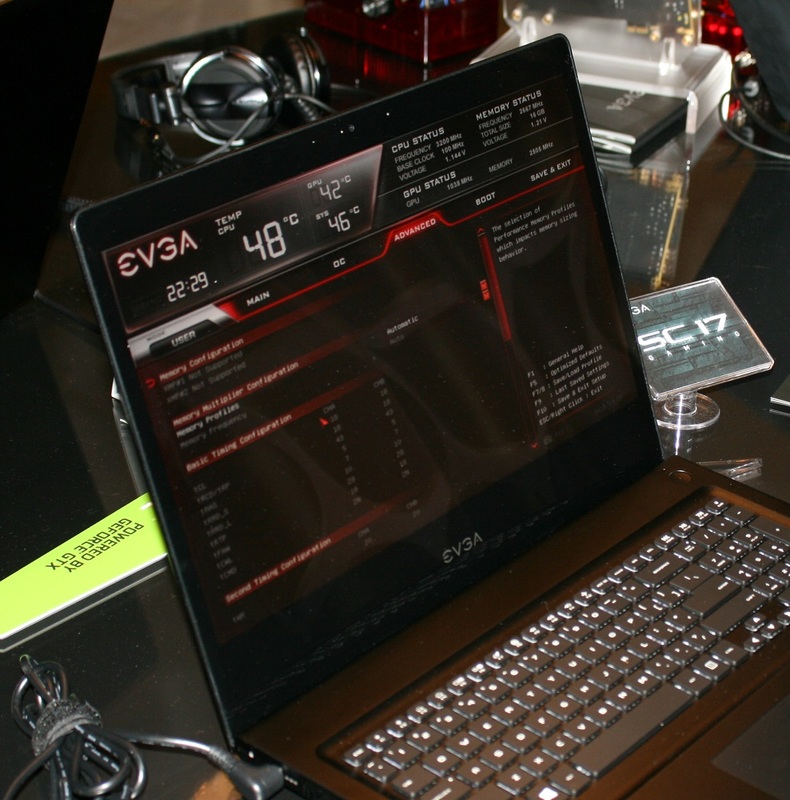 The ultra sleek looking EVGA gaming laptop seen below is going to be an absolute treat for those looking for a desktop replacement. It comes with a 17.3″ 4K UHD-1 GSYNC display (you can raise it with one finger from the closed position), USB3.1 Type-C port, a Synaptics clickpad 1.5, full HD front facing camera, and battery life of up to four hours. While four hours doesn’t seem like a lot, it really ends up being a lot considering the hardware its driving. The SC 17G comes with the Intel i7 6820HK (2.7 GHz boosting to 3.6 GHz in 45W TDP processor 16GB DDR4 2666 MHz memory, 256GB M.2 drives in a 2 x 128GB in RAID0 configuration, as well as a 2TB platter drive for storage. A unique feature about this mobile processor is, as the “K” moniker tells us, an unlocked CPU which you can overclock! And it is in a laptop! The GPU used to drive the 4K monitor is the NVIDIA GTX 980M, which also has overclocking support. To remove some of this heat the laptop is said to have over 165W cooling capacity to keep things running cool. It has a built-in EVGA GUI BIOS setup menu which gives full control over the CPU and GPU. Keep an eye out for this to hit the market soon! 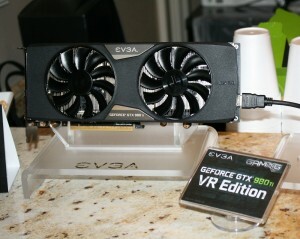 Next, EVGA jumps headfirst into discrete sound cards. 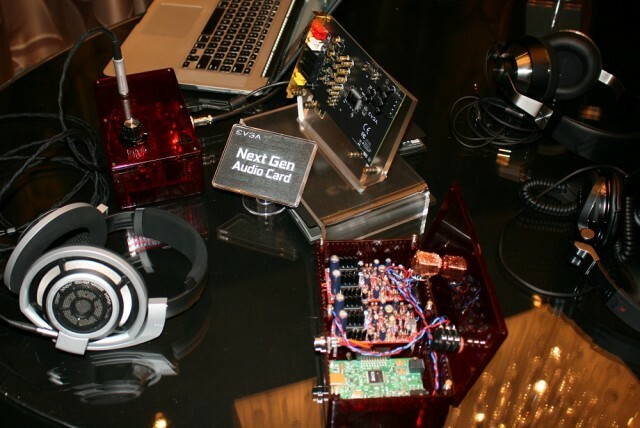 They are targeting both the audiophile and gamer in this case. 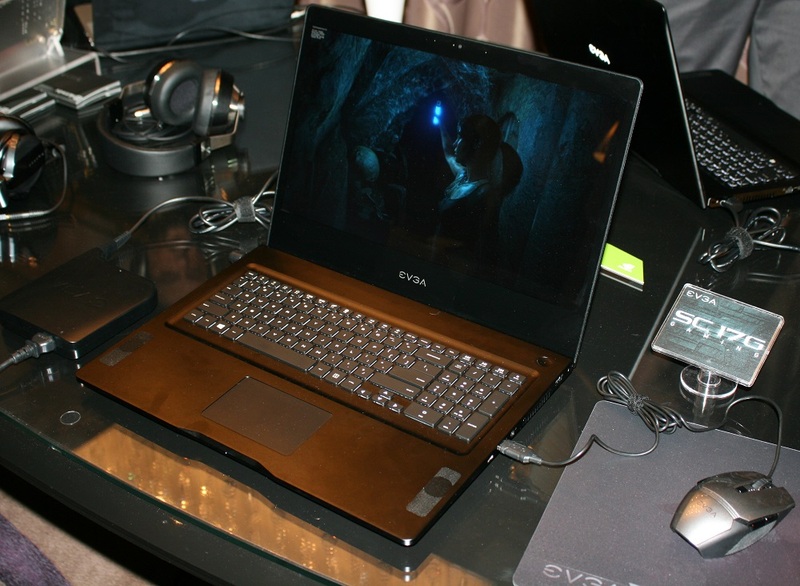 The model we are seeing here will be in PCIe form as well as its own standalone, USB based unit. Please excuse the red acrylic, it is a prototype! While the specifications, and even the name haven’t been set in stone, they told us S/N ratio will be around 140db and THD to be much lower than comparable solutions for this stereo sound card. We were able to listen to these through some average cans, and even a $1,500 set, which sounded absolutely superb to me. The sound was crystal clear and would absolutely be better than any onboard solution. 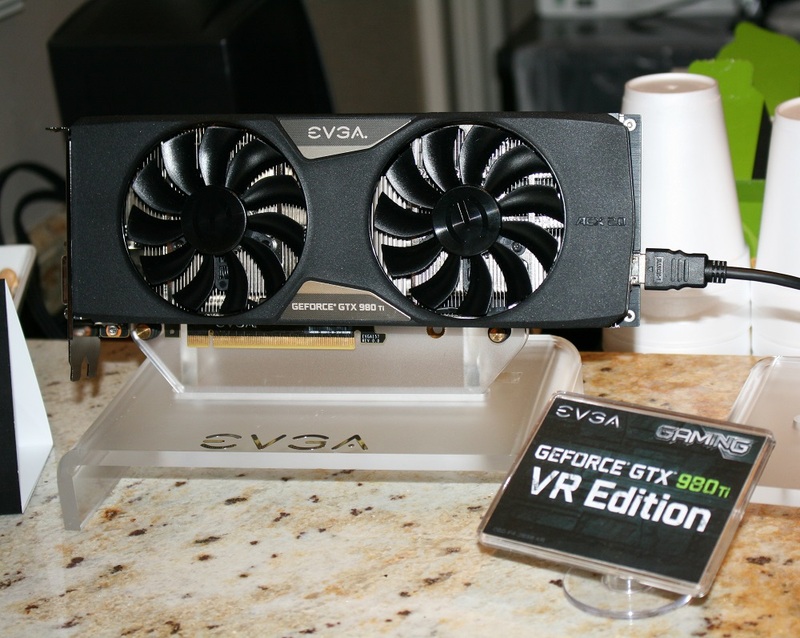 With VR looking to make its public debut in 2016, EVGA has changed up one of their cards and made a VR edition. What this version of their GTX 980 Ti adds are a couple of things. First, there is an HDMI port on the back of the card. 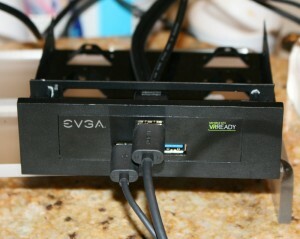 This connects to a 5 1/4″ enclosure that has an HDMI port on the front as well as a couple of USB3 ports (enclosure has a header that connects to your motherboard). This would give your VR device a couple of extra feet of cord being able to plug into the front of your PC case as opposed to the back of your GPU. The next thing we looked at is a new sku in their Z170 line, the Classified K. The big difference here is the addition of the Killer NIC, as opposed to the Intel on the previous, and the removal of the expensive PLX chip (sorry folks, no quad SLI here). While there are a few other changes, think voltage read points removed and PCIe physical slot layout etc, the heart of the Classified board, in particular the PWM, is left in tact. This will bring the price down a fair amount upon its impending release. 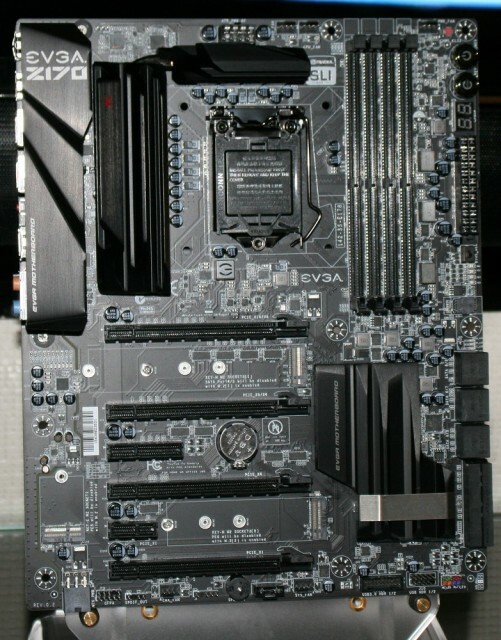 EVGA has had a pretty successful lineup with their mITX Hadron Air and Hydro, but not everyone wants a tiny build. In the past, you couldn’t look at EVGA for anything outside of mITX. Well, that has changed. 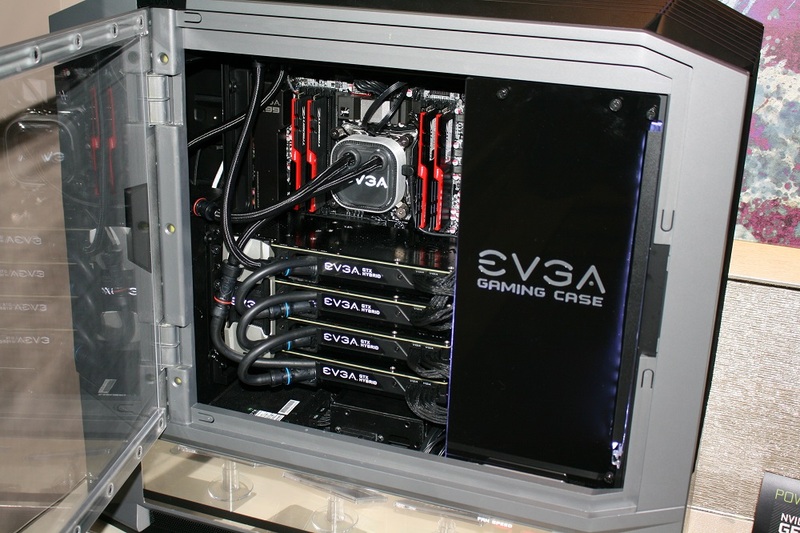 When we walked in to the EVGA suite, we were greeted by this colossal full tower case pictured below. This. Case. Is. Huge. It is not for the feint of heart. On the back of the case is a cover, open in the picture, exposing two fans. These fans remove air from the back of case including the expansion slots. This is said to keep the GPU about 6-7 °C cooler. This design also cleans up the back of the case hiding the wires in that area and letting them out the bottom. It will support a 2x120mm radiator up front and 4x120mm up top. On the side, there is a LED display that shows your fan speeds. 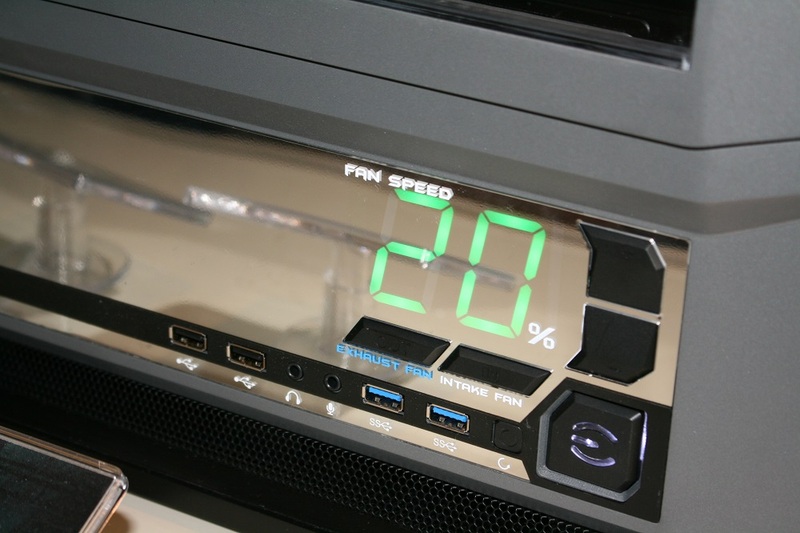 These speeds are adjustable via buttons on the side below that same LED. This is also where you will find the power/reset buttons as well as the mic/headphones and USB ports. Look for this case late Q2 or Q3 this year. 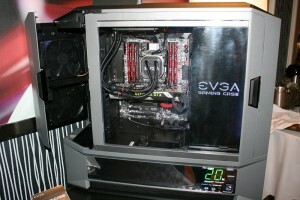 One other thing to note, inside this case, is EVGA’s upcoming AIO watercooling solution. It is dubbed the Hydro QRG Cooler, according to the label. It seems like everyone is getting in on this cooling method, no?! You are able to expand this unit and do so with ease due to a unique feature, its quick disconnects. I don’t recall another water cooler that comes with these. 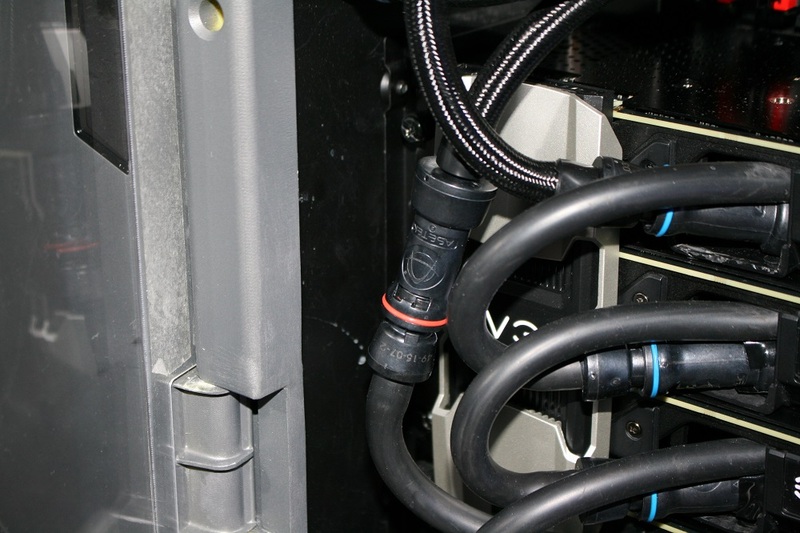 That would make adding components and/or radiators to your loop a much easier task as you just plug them right up! Our last little bit from EVGA is the addition of Titanium level PSUs in lower wattages of 700, 800, and 1000W (not pictured). That wraps up the EVGA portion of this trip, keep a look out on the front page for more!